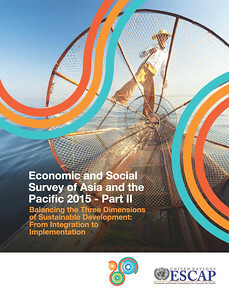 Part II of the 2015 edition of the Economic and Social Survey of Asia and the Pacific (theme study for the 71st Commission Session) examines the integration of the three dimensions of sustainable development as a concept and as a practical implementation principle. Emphasizing the urgent need for a people-centred and planet-sensitive development agenda in the Asia-Pacific region, the theme study outlines a conceptual framework, normative shifts in policy stance, strategies and policy options and offers perspectives on institutional frameworks to support integration of the three dimensions of sustainable development. Regional cooperation will be critical to maximize the opportunities that are presented by a transformation to sustainable development and to mitigate the “first-movers risk” that may be presented. To realize “the future we want”, the study therefore proposes specific options for a coherent response at the regional level.